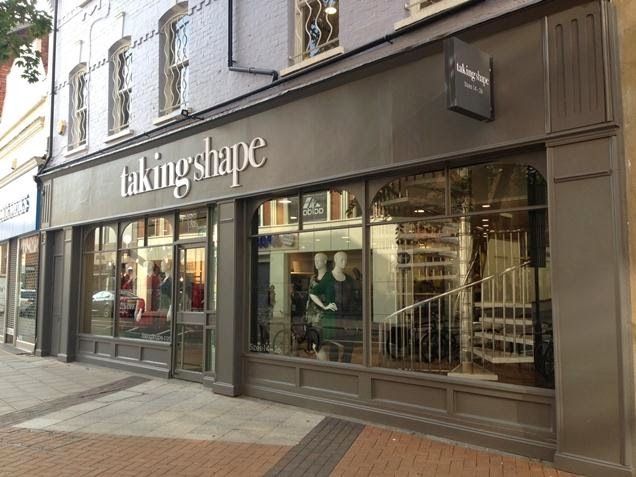 So at the weekend I made my way over to Kingston to pay a visit to the Taking Shape store for a free personal styling session. Now I'm very much an online shopper, there are so few plus size stores on the high street and generally I'm guilty of just adding things to my online basket really without much thought. I have to say that my experience today has really hit home on what I'm missing out on by doing this. It's nice to feel the material, check the quality and see what the fit is like. You can grab a necklace or a pair of shoes and put together an outfit to get a better idea of how you would wear it. You can try everything on, check everything fits you and looks fabulous and make sure you are 100% happy before putting your choices on the till to purchase. Internet returns can be quite a bore but are unfortunately unavoidable, when you go by stock photos on the internet you will always have the odd piece that just doesn't look right on. You can get top notch advice from women that ACTUALLY CARE, at the end of the day they want you to leave with something you love, they don't want you to return it and be unhappy. They also see women of various styles and shapes trying on the clothes on a daily basis, they know what works and what looks good! They will help you browse the store and pick out items that they think will suit you that you may never have picked up otherwise! I find it's great to have that second opinion, especially if you have low self confidence as this often means you can't believe that you do look good in anything and often leave feeling down and miserable. When I was observing in the changing rooms to get an idea of the advice given and how people are looked after, a group of us started chatting and were giving each other advice/opinions on outfits. It was amazing, a group of strangers literally speaking like old friends and having such fun with fashion. The people I met throughout the day were so engaged with the clothes, loved all the prints so willing to talk about their personal styles so we could help them find amazing clothes for them. My experience definitely has made me reconsider visiting more shops for a proper instore nose around. Anyway! Back to my account of the day! So I arrived at the shop, was warmly greeted and had a wander around to look through the bits and pieces at my own leisure with helpful tips and recommendations from the ladies at regular intervals. The shop floor is nice and organised, no clutter, plenty of colour and brilliant prints that catch your eye immediately when you walk in. The shop spans over 2 floors and has clothing, accessories, footwear and also a selection of gifts/toiletries to choose from so there really is something for everyone. After picking out a selection of things to try on I made my way to the changing rooms, I love the decor of the waiting area below with the vintage mirror designs. As you can see from my rail below I really went to town and tried on way too many things to include photos of on here but I might put them on Facebook, we shall see! With this in mind I will give you a glimpse of some changing room action for a few select pieces. First up is this gorgeous Everglade Dress, I think the pattern is so pretty with floral and bird details and a mixture of red, green and cream colours. The dress itself has some stretch and is very comfortable on, the arms offer a little bit of coverage and the length is just at the knee (I'm 5ft 7). Next up is possibly my favourite out of all the pieces, this beautiful French Swing Tunic. I think the beauty is in the simplicity, it is cut brilliantly and just so flattering on and I can picture myself wearing it in so many ways. You can wear over leggings or jeans for a dressed down look or you could pair with a skirt or trousers for a smarter look. I got the tunic in silver but they also have it in purple incase anyone is wondering. Needless to say I bought it! I also love this next dress which is the Alexis Dress*. Now this is not something that I would ever have picked out myself, you guys have seen my normal style and normally this dress would be far too "out there" for me, but I was talked into trying it on and just loved how it looked on. The whole dress is completely stretchy and comfy, the arms are 3/4 length so show off the slimmest part and the print is just incredible. The pattern looks to be some sort of collection of parrots and tropical birds with the main colour themes being blue and green, it's really quite unusual. I had to take this dress home with me, I've even worn it at work! Next is the Honor Dress which gives a nice nod to the floral trend for this spring. The dress fabric/cut is literally identical to the dress above so I felt I should choose between the two and went for the Alexis due to the unique print. The Honor dress would be perfect with tights and heels for an evening look or over leggings during the day. We then have something completely out of character and a first for The Human Mannequin, a MAXI dress! Don't shoot me for saying this, but I have NEVER so much as tried on a maxi before. I guess I have just never been convinced that it would look flattering and have an image of Homer Simpson in a MuuMuu forever engrained in my brain. I can confirm that this is a complete myth, as you can see below it doesn't make me look particularly huge, maybe even taller? This Enchanted Lands Dress comes down to about mid way between my knee and ankle so isn't quite a floor reacher, meaning I can break up the vivid red print with a nice pair of black opaque tights and show off my slimmer ankles. I didn't get the dress, but it has definitely made me rethink my outlook on maxis. Next is this awesome Aztec print combo, a 2 piece matching set consisting of the Tortoise Print Trousers* and Tortoise Print Top*. I was intrigued as soon as I saw this set on the rail, the print is so bang on trend, it's geometric/aztec looking but not really seeing much tortoise? The top has good coverage on the sleeves and isn't actually cropped, I just styled it that way below as I wanted my plain black vest to break it up a bit so I don't look like I'm wearing a jumpsuit. Both pieces are completely stretchy viscose and something I could see myself wearing alot! Needless to say I got them! And finally the Silver Bloom Dress, it's floral, pastel and stretchy with long arms, that alone made me just have to try it on. The neckline is nice and high, but the crossover/wrap effect gives a good shape. The dress comes down below the knee on me and looked great with black opaque tights. I didn't get this dress as I don't think it really suits me, but it's a nice piece. Q: What would be a typical purchase made by your average customer? A: Items for layering, maxi dresses for the summer now the weather is good and lot's of colour! A: Generally over 40, a mature woman with an established style that has a good idea of what they are looking for. Younger women don't come in too often, but this could be that the younger generation prefer to shop online to suit busier lifestyles. Q: What lines are doing well at the moment? A: Accessories go down really well, we always have lot's of offers on with reductions. Shoes and boots also sell well. Q: How many people are taking advantage of the free personal styling sessions so far? A: Well during the week people generally have a lot more time for them, but people often need prompting instore to have a session. Some people don't have the time, others come in and already know what they want but others don't ask due to a lack of confidence. Q: What can be done to help that? A: Well if they don't want to ask for a session when instore you can call up the store beforehand and book in a time to have a one on one styling session. I would really recommend to try the sessions. Sorry this post has been such a long one! I just felt I had to share my full experience, and I should point out this isn't a sponsored post or anything, I just really had a good time and wanted to give a heads up to any of you girls based in London as I really think it's worth a visit. Thanks so much for reading, leave any comments below on your thoughts on Taking Shape or shopping instore and I can reply back.